Members present where; Chairman, Paul Bussiere, Vice Chairman, David Scalley, members Joan Karpf and John Trammell, and alternate member, Frank Maturo. Also present were Bill Dowling, Jeremy Oleson, Nancy Mitiguy, Erik Bergum, John D�Urso and Rob Gauthier. 6:59 PM, A quorum being present, Chairman Bussiere called the meeting to order. Chairman Bussiere asked if he should allow comment from the floor regarding the minutes review. It was decided, once a motion was made and seconded, the matter could be opened up for discussion which could include comments from the public. Corrections noted by the Board were: on page 8, insert after the second paragraph, �Chairman Bussiere said Ms. Karpf questioned if a special exception was required and asked that he contact Town Counsel regarding that question.� On page 6, 4th paragraph, first word �Mr. Karpf� should be �Ms. Karpf�, at the end of that paragraph, last sentence �RB (residential business)�, should be � R2 (residential Bretton Woods) on the tax map at Town Hall�. Ms. Karpf offered a motion to approve the minutes as amended. Chairman Bussiere seconded the motion. Discussion: Mr. D�Urso from the public said, regarding page 3, third paragraph, instead of � very minor repairs, such as changing tires� he meant to say �very general repairs to bring vehicles up to inspection standards� and asked that this be changed. The general consensus was to change the wording as requested by Mr. D�Urso. The vote was 7 � 0. The motion carries. Chairman Bussiere said Mr. D�Urso has provided the information, maps and measurements as requested by the Board. Ms. Karpf said there seems to be a discrepancy regarding the measurement. She said using the figures from the diagram given, the total measurement is 60 feet. Mr. D�Urso is stating that it is 95 feet. She said also that there is a discrepancy with the width of approximately 10 feet. She said she is most concerned with the width in the front. Ms. Karpf also was concerned regarding the flow of vehicles in and out of the property and the right�of�way to the residence behind the property. Free flowing conversation took place between the different Board members and Mr. D�Urso.
. Ms. Karpf said the Regulations require 1 parking space per 400 square feet of the building and this building is 1500 square feet. She said, also the Regulations require one (1) space per 2 employees. The parking spaces are noted as 10� X 20� in the Regulations. There was further discussion regarding the size and number of parking spaces. Eventually everyone agreed with three (3) parking spot for customers, one (1) for employee(s) and twelve (12) for the sale of vehicles. Chairman Bussiere stated if Mr. D�Urso uses the island, it is State property and the State may expand the road. He wanted Mr. D�Urso to be aware of this. Mr. D�Urso said, in the event that did happen, he would not use the front for display, only for in and out customers. Chairman Bussiere said some people use this (State owned) area thinking it is their own property. The State has the right to make them move anything off this State owned property on the sides of their roads. Chairman Bussiere emphasized that the right�of�way to the residence behind the property must stay open. Ms. Karpf said she was concerned with the safety issues. Mr. D�Urso was asked if he anticipated any landscaping. He said he would work with the abutter, Jeremy Oleson, regarding a privacy fence. Mr. Oleson said he would like the fence along the entire property line to the right�of�way at the back of the business. He does not want a wooden stockade fence but something that is maintenance free and six (6) feet high. Mr. D�Urso agreed to this. Mr. D�Urso said he does not plan on putting in any plants or trees. He said, as soon as his financial situation improves, he will do some work on the building. Chairman Bussiere said there is a �blight ordinance� and sited Section 408.4 Littering, Waste and Illegal Dumping, and Section 408.5 Property Maintenance Standards, in the Town of Carroll Zoning Ordinance. Mr. Scalley said the property should be kept clean with no junk cars, parts or tires scattered around. Mr. D�Urso said the building was on a slab. There is water to the building. Mr. Maturo questioned if there were any other abutters. Mr. Oleson was the only abutter present. He said he hopes Mr. D�Urso was successful, that there is a need for business in Town. He did say he would like to see improved siding, especially on the back of the building which faces his residence. He said new siding would be a plus for both he and the business, making it aesthetically pleasing. Mr. Oleson asked what timeframe Mr. D�Urso was looking at for the fence as he (Mr. Oleson) didn�t want it to go on for years before it was put up. Mr. Scalley said he would also want to see a sign at the right-of-way stating it is a private driveway. It was clarified that there would be a maximum of twelve (12) vehicles for sale at any one time displayed on the property. Chairman Bussiere told Mr. D�Urso, if he wanted to expand that number of vehicle for sale or displayed, he would have to come back to the Board for a Special Exception to expand since he is on a non-conforming lot. Chairman Bussiere offered a motion to close the Public Hearing. Mr. Scalley seconded the motion. The vote was 5 � 0. The motion carries. Criteria 1) The proposed use shall not adversely affect the capacity of existing or planned community facilities. the impact would be very small. Criteria 2) The proposed use shall not adversely affect the character of the area affected. on this site for many years previously. exit is on a State road already exiting. 1. A six (6) foot privacy fence be erected, the length of the property line with the abutter to the right-of-way and repair of the building especially the siding of the back of the building be improved to the abutter�s satisfaction. 3. Protection of the right-of-way must be maintained. After discussion Mr. Scalley added � placement of a sign stating �Private Driveway� shall be erected at the right-of-way. 5. The property will meet and continue to meet, Section 408.5, Property Maintenance Standards of the Town of Carroll Zoning Ordinance. 6. There will be parking for one (1) employee and three (3) customers on the site at all times. 1. A six (6) foot privacy fence be erected, the length of the property line with the abutter extending to the right-of-way and repair of the building, especially the siding of the back of the building, be improved to the abutter�s satisfaction. Mr. Trammell seconded the motion. The vote was 5 � 0. The motion carries. Chairman Bussiere said after consulting with Town Counsel, it was found that this retail business is an approved use in the RB (residential business) Zone. (Attachment A) He said he wanted to be on the safe side and that is why he advised Mr. D�Urso to apply for a Special Exception since the property is on non-conforming size lot. He said the Board should refund the costs to Mr. D�Urso for application fees, postage and publishing costs. Ms. Karpf offered a motion to refund to Mr. D�Urso all cost paid for application, postage and publishing for the Special Exception related to Map 206 Lot 45. The amount to be charged to the Board of Adjustment budget. Mr. Scalley seconded the motion. The vote was 5 � 0. The motion carries. Chairman Bussiere said he and the Secretary had received correspondence from Horizons Engineering asking that this Public Hearing be continued to the December meeting. Chairman Bussiere offered a motion to continue the Brooks excavation Public Hearing to December 12, 2013. Ms. Karpf seconded the motion. The vote was 5 � 0. The motion carries. Chairman Bussiere said there has been questions regarding the R2 zoning of the map and lot involved in the Brooks excavation case. He sent e-mails to Town Counsel regarding this question. He said there was an amendment to the Zoning Ordinance in 1989 that resulted in reverting the parcel(s) in question back to the R1 zone. He read Attorney Jae Whitelaw�s response. (Attachment B). Chairman Bussiere then read another e-mail to Town Counsel (Attachment C) and her response. 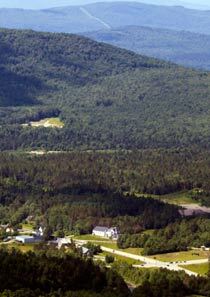 He said prior rulings by the ZBA have been with the view point that this and other parcels in the Bretton Woods area are under the R2 zone, siting the AMC property among others as examples. Ms. Karpf asked the Chairman if he sent her three specific questions to Town Counsel regarding the zoning. She said she went to the Coos County Registry of Deeds and has the Concept Plan Narrative Summary and Description (Attachment D) and the Development Agreement (Attachment E) and also the Plan Map (Attachment F) that were filed with the Registry of Deeds. She said according to the map and the description on the Narrative, the Brook�s parcel is not in the R2 zone. She asked again if the Chairman had sent her three questions to Town Counsel. Mr. Bergum said he can�t speak to the AMC project but applying the precedent of the last six (6) years, the Planning Board has interpreted the area (Brooks excavation), as in the R1 zone. He said he is concerned for the legal liability for those that had to follow the R1 Regulations. He said extending the R2 zone to other people is not practical. He said from a Planning Board perspective he wants to hear what Town Counsel�s view is of Ms. Karpf�s questions is. He said he will send the answers to all members of the Planning Board. Both Mr. Bergum and Chairman Bussiere said they were concerned about where they stand with the law on prior decisions. Ms. Karpf said the Town Meeting adopted the Concept Plan for the owners and associates of the resort areas. She said it would not make sense that they could extend that Plan to other properties outside of what they own. She said the deed described in the Concept Plan Narrative and the Plan Map (both of which display the Registry�s filing and date) were filed at the Registry of Deeds and show the R2 area. The Concept Plan area, does not extend to the other areas like the Brook�s excavation area. Chairman Bussiere produced a �future use� map which shows the Concept Plan area and the surrounding parcels that could be used in the future. He said this map was produced by North Country Council. He said this map shows the entire Bretton Woods area as R2. Ms. Karpf asked Chairman Bussiere again, if he had sent Town Counsel her three questions. (Attachment G) Chairman Bussiere said yes he had but has not received a reply yet. Mr. Bergum said this has much bigger implications than just the Brook�s excavation. Chairman Bussiere said he had changed the Secretary�s salary line to $1500.00. He said, the line has been over spent this year and he would rather be able to give back some money if not needed than need the money and not have it in the budget. The Secretary, Linda Dowling, said she understands that the Budget Committee was discussing raises last night at t heir meeting. She said that made her think that the evaluation process had been completed. Chairman Bussiere said yes, for the most part it was. Ms. Dowling than said she is a Town employee and had not been given an evaluation and hopefully the salary adjustment that would go with it. Chairman Bussiere said that was an oversight and he will talk with Donna Foster, Chairman of the Planning Board about it. Ms. Karpf offered a motion to accept the amended budget. Mr. Scalley seconded the motion. The vote was 5 � 0. The motion carries. The Secretary said she looked up the RSA for the term of office for alternate members and found that it is three years. When the Board appointed Mr. Maturo it wasn�t know what the term would be. Chairman Bussiere asked if that would prevent an alternate from running for a permanent seat on the Board. The answer was, no. Ms. Karpf offered a motion to appoint Frank Maturo as an Alternate Member of the Carroll Zoning Board of Adjustment for a three year term. Mr. Scalley seconded the motion. The vote was 5 � 0. The motion carries. Mr. Dowling said the Selectmen discussed this. Provan & Lorber�s $3,000 figure is just a ball park figure. Ms. Karpf asked if the ZBA should work with the Planning Board on this. The Secretary said the Planning Board did not want to contract with one single Engineer because that would prohibit him from doing private work in the Town. After more discussion it seemed to be the consensus that the ZBA would follow the example of the Planning Board and contract on an �as needed� basis. It was also noted that the ZBA didn�t usually need the services of a Town Engineer. Mr. Scalley offered a motion not to sign the contract agreement with Provan & Lorber. Mr. Trammell seconded the motion. The vote was 5 � 0. The motion carries. After discussion regarding what line in the budget these books are paid from, it was decided to order six(6) and � books (the � for the Secretary, the Planning Board would fund the other �). That would amount to $96.00. It was then discussed whether or not to increase the Office Supplies line item amount in the 2014 budget request. (line 626) The Secretary said she just got the figure for the pricing for copies (made at Town Hall) and that would also fall under Office Supplies. Ms. Karpf offered a motion to raise the Office Supplies line item in the 2014 budget request to a total of $200.00. Mr. Scalley seconded the motion. The vote was 5 � 0. The motion carries. There were two letters for the Board�s information needing no action. 2. Letter of Appointment to Frank Maturo. Updated information sheet were given out with the newly appointed members� information included. Ms. Karpf offered a motion to adjourn. Mr. Trammell seconded the motion. The vote was 5 � 0. The motion carries. 9:40 PM Chairman Bussiere adjourned the meeting.